Most of the higher end soundbars, mainly those in the $500 range and up, come with standalone subwoofers. This allows the user to experience great bass response, which completes the sound stage. 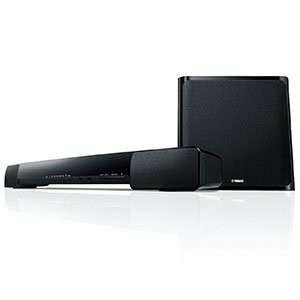 What you will often see are wireless systems that require no hard connection between the soundbar and the subwoofer. If this idea is something that you are interested in, you are in the right place. 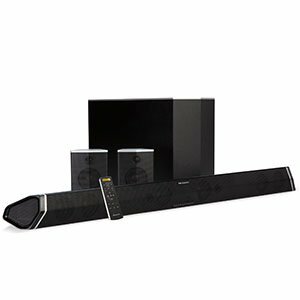 We have selected some of the best wireless soundbars for you to check out. The models we selected belong to different price ranges, allowing you to find something that best suits your budget. 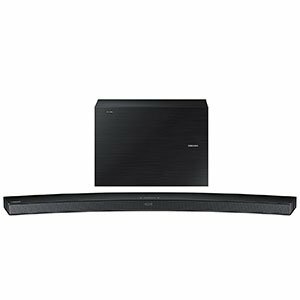 Samsung’s high end curved soundbar lineup which was originally designed for their curved TVs. However, the quality of this system quickly became known. HW-J6500 brings a very intense sound stage with vibrant tone profile that is backed up by cutting edge features. Even though it’s among the more basic models in the family, it brings all the core benefits. What sets Nakamichi Shockwafe Pro aside from the rest of the soundbars is the sheer number of speakers it brings to the table. We are talking ten drivers in the soundbar itself, plus the subwoofer unit. On top of the raw muscle, Shockwafe Pro comes with all the necessary software solutions to harness that power. No visual feedback on controls. YAS series of soundbar speakers have been a safe go-to option for a very long time. Yamaha designed the YAS-203 in a way that brings you a little bit of everything. Ultimately, this soundbar is capable of elevating your TV watching experience to a whole new level. If you are looking for a balanced midrange solution, this is it. When deciding if a wireless soundbar is right for you, the main thing you should take into account is the layout of the location in which you will be housing the soundbar for the majority of its use. One of the great things about this kind of audio technology is that it is both incredibly portable relative to a larger set-up, and, importantly, the actual process of installing and adjusting the equipment to the room itself will take you mere minutes. It used to be the case that once you had installed your home cinema set-up, that was it. You couldn’t easily make adjustments to the majority of it, and the idea of uninstalling, unplugging, transporting, and reinstalling all of it in a new location was more of a nightmare than an exciting prospect. But those days are gone, and wireless soundbars are very much at the forefront of this development. Whilst the benefits are many (and will be outlined below), you should be aware that unless you are shopping towards the higher end of what is available on the market, you will often lose out on other features if the model you decide on has chosen to go wireless. This is simply a matter of prioritizing some features over others and is just as much of a concern when buying any kind of consumer electronics, so it should not be a deal breaker but is worth keeping in mind throughout your decision making process. Soundbars in general were made to substitute cumbersome, conventional audio systems. However, solving the issue of good bass response is something that was deemed to hard. In other words, there is yet to be a soundbar that offers good bass without having a large subwoofer unit. As a result, we are seeing soundbars with standalone subwoofers pretty much anywhere from $300 range and up. Some of the best soundbars on the market owe a good part of their reputation to that subwoofer. The problem with subwoofers used in combination with soundbars is positioning of both. Most modern soundbars are designed to be versatile. You can place them on a piece of furniture where your TV is, you can mount them on the wall or pretty much where ever you deem fit. What this means is that a subwoofer has to be somewhere near by purely because of the cable connection. Not only is this limiting in terms of finding a good layout that works for your room, but it also looks pretty sloppy. There is also a lot to be said for the fact that having more than one piece of audio equipment in your setup creates a great deal of immersion out of the box. You may be surprised that the simple addition of a subwoofer to the mix can have quite a dramatic effect, and with the flexibility to place it anywhere within the room, you should be able to find a point at which the two devices can work optimally well together in order to create a real sense of presence, weight, and scale. It’s a real treat to behold. his is the main reason why so many soundbars feature a wireless subwoofer these days. The benefits are simply too numerous to ignore. A wireless subwoofer allows you to mount the soundbar on a wall or piece of furniture, but place the subwoofer in a different part of the room. This way you can fine tune the acoustic properties of the system to perfectly match your room. Speaking of which, if there are any satellites, they will also be wireless. What many fear when it comes to wireless audio is the qualit y of sound. Wireless protocols used for this purpose are capable of much more than just sending audio signal in real time. There is absolutely nothing to worry about unless you deliberately place a solid object between the subwoofer and the soundbar. This will cause all kinds of problems with the connection. However, no one really has a need to do that. Placement is not just a matter of convenience, of course, and can have a huge impact on the overall performance of your audio equipment. To provide an obvious example, if your soundbar and subwoofer are right on top of each other and right next to the television set, your listening experience will not be as immersive or give as much of an ‘all around the room’ feel as it would if you gave the sound more room to breathe and covered more angles in your placement. To a greater or lesser extent depending, usually, on the hardware involved, different devices have different (and, importantly, differently sized) ‘sweet spots’ at which the sound is best reproduced and delivered. It is important to trial your soundbar and subwoofer separately and together in order to work these out and, having done that, to combine them in a way that fits the individual requirements of the particular room and, of course, your own preferences. With this done, the difference in the overall performance will be recognisably improved and you will kick yourself for not having invested in this kind of solution earlier! We’ve been there, and it’s quite the revelation, you can believe us. Having a wireless soundbar and subwoofer system is not only a matter of aesthetics and convenience, but performance as well. Simply by removing that hard link between these two components, you’re able to fine tune the performance of your entire system. Wireless systems used to be exclusive to top end segment of the market. That is changing very quickly. You can get a wireless setup at a very reasonable price these days. In all honesty, there is no reason why you shouldn’t get one. No matter how you look at it, the benefits outweigh whatever flaws you could think of. Of course, there may be situations in which a wireless option isn’t right for you, or you find a device which ticks more of your boxes which happens not to have any wireless functionality. This is fine, too, and isn’t the end of the world. The great thing about wireless technology is that it is only getting more popular as time goes by and, before too long, it may well be the case that the overwhelming majority of what is on offer in the consumer audio market (and, well, pretty much every other technology venture there is) comes primarily in a wireless flavour. Until then, the decision is yours to make!